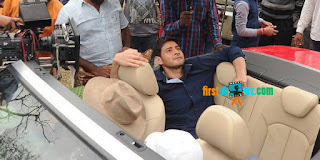 Superstar Mahesh Babu starrer Brahmotsavam has recently shot crucial shots at the locales of Haridwar, Udaipur and the team has succesfully wrapped up the shoot portion in the schedule. "After a long schedule in Haridwar n Udaipur, finally back in town... Only to shoot some more..#Brahmotsavam" informed Mahesh Babu. The film is almost completed and there are few scenes to be canned in the new schedule. Brahmotsavam film is being directed by Srikanth Addala which has Samantha, Kajal Aggarwal and Pranitha Subhash as the leading ladies. The film is produced by PVP Cinemas with Potluri V Prasad as the producer. Mickey J Mayer is composing tunes to this classy entertainer.